Inspired by a traditional Indonesian blade, our Damascus Steel Karambit Knife is modeled from a popular weapon used throughout the world. There is a steel loop on the grip allowing for stability no matter how you hold the blade. Influenced by the claws of a tiger, this Damascus steel blade features unique swirls from being folded with 250 layers of steel. Included with this knife is a brown leather sheath that features a buckle for easy transportation and access. 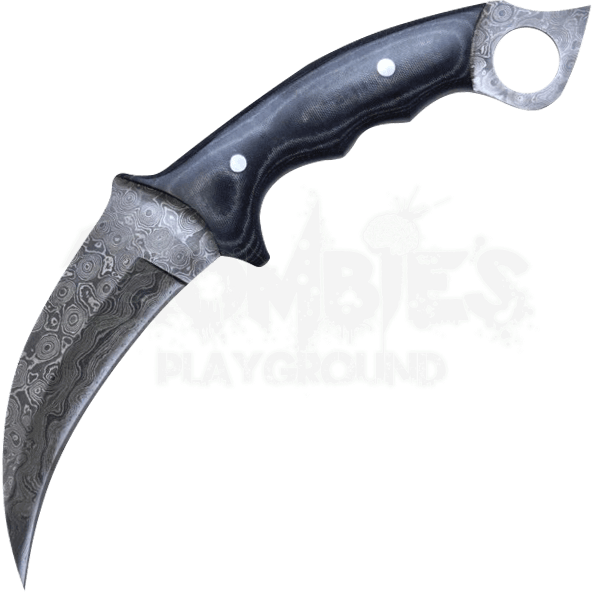 This blade was known for its distinct curvature and will make for a stand-out dagger in your collection of weapons. Though originally the karambit was designed for agricultural purposes, over time as it became weaponized the curvature was increased to maximize the cutting potential. Whether you hold this blade pointing downward from the bottom of your fist or in a hammer grip, you will quickly learn why this was so popular and versatile, and why we still use it today.